Are you looking for a deliciously scented, revitalising body spray? Guinot has developed a body spray that gives you a splash of sun while respecting your skin. Eau Mirific hydrates and provides much needed freshness all day long. Its light, subtle and soothing fragrance is sure to please. 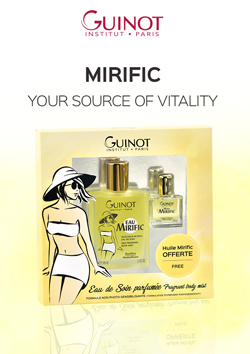 Try Eau Mirific now in an exclusive gift set* containing a free mini Huile Mirific, a Guinot classic! *Available in participating Guinot beauty salons in France; subject to availability.